There are 15 Assisted Living Facilities in the White Plains area, with 3 in White Plains and 12 nearby. The average cost of assisted living in White Plains is $5,875 per month. This is higher than the national median of $3,346. To help you with your search, browse the 114 reviews below for assisted living facilities in White Plains. On average, consumers rate assisted living in White Plains 4.4 out of 5 stars. Better rated regions include Greenwich with an average rating of 4.5 out of 5 stars. Caring.com has helped thousands of families find high-quality senior care. To speak with one of our Family Advisors about assisted living options and costs in White Plains, call (855) 863-8283. White Plains is a lively suburb of New York City located in Westchester County 25 miles north of midtown Manhattan. It’s home to 59,047 people and 15.2 percent of which are seniors. White Plains has 118 assisted living facilities in and around the city to accommodate this population. These facilities are regulated by the New York State Department of Health and are defined as adult care facilities (ACFs) providing non-medical, long-term residences for seniors. White Plains offers plenty of arts and culture for seniors to enjoy including the White Plains Performing Arts Center, the White Plains Historical Society and the New Westchester Symphony Orchestra. Seniors over 60 can receive coupons for the Farmer’s Market as well as transportation to the market on the Community Center bus. The weather in White Plains is seasonal with warm, humid summers and cold winters. Temperatures vary from between 23 and 84 degrees Fahrenheit throughout the year. On average, the city gets 49 inches of rain and 30 inches of snow, above the U.S. averages of 39 inches and 26 inches respectively. Crime in White Plains is low, which is good news for seniors wishing to reside in a safe area. Violent crime received a low rating of 14.7 out of 100 compared to the national average of 31.1 and property crime scored 30.4, slightly lower than the U.S. score of 38.1. Seniors on a budget may have difficulty living in White Plains as the cost of living is 67.2 percent higher than the U.S. average. This number is due mostly to high-cost housing with health care, grocery and transportation costs being only slightly higher than national averages. Getting around White Plains is easy on the Bee-Line Bus, which offers reduced fares for seniors over 65 and has plenty of bus routes around all of Westchester County and into Manhattan. The county also provides ParaTransit which is a shared ride service and the Senior B.E.A.T. program is available to instruct seniors on how to use the transit system. White Plains has an array of community resources for seniors through the Department of Senior Programs and Services, an organization which offers programs and events to seniors throughout the year. White Plains is also home to the White Plains Senior Center. Assisted Living costs in White Plains start around $5,875 per month on average, while the nationwide average cost of assisted living is $4,000 per month, according to the latest figures from Genworth’s Cost of Care Survey. It’s important to note that assisted living rates in White Plains and the surrounding suburbs can vary widely based on factors such as location, the level of care needed, apartment size and the types of amenities offered at each community. 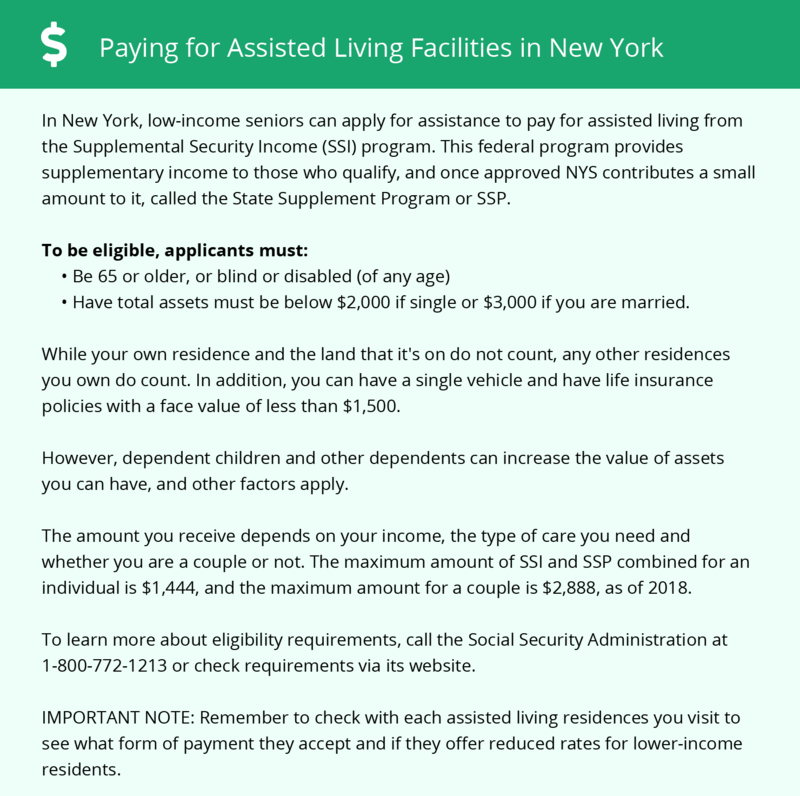 Eligible seniors may be able to receive financial aid for assisted living in White Plains through two New York government programs: Medicaid’s Managed Long Term Care Waiver (MLTC) and the Assisted Living Program (ALP). White Plains and the surrounding area are home to numerous government agencies and non-profit organizations offering help for seniors searching for or currently residing in an assisted living community. These organizations can also provide assistance in a number of other eldercare services such as geriatric care management, elder law advice, estate planning, finding home care and health and wellness programs. To see a list of free assisted living resources in White Plains, please visit our Assisted Living in New York page. White Plains-area assisted living communities must adhere to the comprehensive set of state laws and regulations that all assisted living communities in New York are required to follow. Visit our Assisted Living in New York page for more information about these laws.